A brief history. Hitchin Town Hall, the new one, was built in 1901. The old Town Hall, in Brand Street and now the Ivory, built in 1840, was regarded as being too small. Local worthies, Frederick Seebohm, William and Alfred Ransom had offered land in Brand Street for the erection of Assembly Rooms or a Hall in 1897. The site on which the new hall was built had been W H Jelly’s tin plate workshop. The new hall was designed by E.W Mountford and Geoffrey Lucas, and built by the local firm of Matthew Foster & Co. The Hall incorporated the Mechanics’ Institute and Workman’s Hall, built in 1868. The Hall had one large area used for dances, concerts and various large scale community events. Upstairs the Lucas Room provided a bookable group area for community meetings. On one side of the ground floor a bar area led to the gymnasium and Workman’s Hall. For an excellent and detailed description of the site see the (desk based) assessment of 2010 by Keith Fitzpatrick-Matthews’ (the NHDC Archaeology & Outreach Officer) – as quoted in Brent Smith’s Brief History of Hitchin Town Hall (August 2011). Concern about the Town Hall. The Town Hall has been well used over the years and particularly valued for the sprung floor, and described as the best in the eastern region by Brian Limbrick MBE, the founder of local country dance groups and a caller for many events. However reports of the hall’s dilapidation had been made for several years, with a call for urgent repairs in the Comet in 1995, and by Brian in a letter to the Comet in 2002. Museum review. In 2005 NHDC undertook a review of its various community halls. This Best Value Review found both Hitchin and Letchworth Museums unfit for purpose and the Burymead Resource Centre outdated and inefficient. It suggested closing the two existing Council run museums and instead run a museum and gallery on a single town centre site. They saw the most likely home for the new facility to be in an industrial unit located in Letchworth. This proposal was greeted with little enthusiasm. Hitchin people thought that our existing museum building (Charnwood House) originally gifted by the Moss family for use as a museum was ideally situated, with the Physic Garden alongside, and sharing mutual benefit with the library. Furthermore, the building could be easily extended on its attractive site. David Rice of Hitchin Art Club produced several different ideas which were sympathetic to the original building. The council did not favour those ideas. Apparently, Charnwood House was poorly maintained and damp enough to raise frogs. Hitchin Town Hall. Hitchin (Town Centre) Initiative saw an opportunity to manage the Town Hall and in January 2006 was awarded £10k to undertake an appraisal of the options by the regional development agency (EEDA). In January 2006 NHDC set up an ‘Arts Heritage and Cultural Forum’ to explore future provision of museums amongst other issues. In March 2006 NHDC announced a “multistranded approach to consider the future” of HTH, but it was later revealed that they had by then already decided to transfer Hitchin Town Hall to a third party. The pot was beginning to boil. 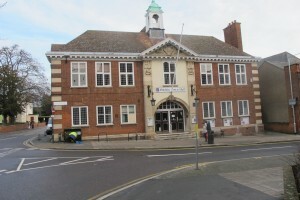 By November 2006 it was reported in the Comet that the Town Hall could be put up for sale, which was formally announced by the Council in February 2007. There was an immediate outcry with protests on the streets. By July NHDC had short listed bidders who were interested in taking over the management of the Hall. Following a quick check by Chris Parker of Keep Hitchin Special, it was found that the preferred candidate company had financial irregularities, as did the next two in line. This forced a Council rethink and Hitchin Town Centre Initiative made a bid to take over the Hall. Negotiations continued through 2007. HTCI and NHDC made a bid for Lottery funding of £850k to refurbish the Hall, but it was announced in April 2008 that they were unsuccessful. Joined up thinking? By February 2009 NHDC had a new plan. Having reviewed the District’s museums they proposed that they be merged into one which would be in Hitchin Town Hall. A feasibility study by external architects came up with a proposal in October that year whereby the Mountford Hall was to be divided horizontally to provide two floors devoted to exhibits, with the mezzanine floor accessed by a rather nice looking staircase. Although not supplying anywhere near enough storage space, it was at least going some way to addressing the museum problem. A proposal to include community facilities was rejected by NHDC Cabinet in October 2009 seemingly on the basis of the objections by a small group of neighbours, despite strong community support for the combined use of the buildings. Further meetings over the next few months were fired partly by a petition started in September to retain the Town Hall as a community hall and attracted 5000 supporters. Concern about how refurbishment might lead to unwelcome changes in the Hall led Chris Parker of Keep Hitchin Special to apply to English Heritage for listing (Grade II listing was confirmed in October 2010). Council and Community joint plan. By December a proposal by community groups for a combined Museum and Town Hall project were being discussed, and in February 2010 the full Council did then agree to the combination of a District Museum and a ‘community facility’. For Hitchin Initiative Brent Smith came up with an imaginative plan which involved the purchase and demolition of the shop next door, no.14, the resulting larger footprint providing more space and an improved entrance for the museum. Most importantly, it preserved the Mountford Hall and the Lucas Room, although with slightly less on-site storage space than the original NHDC “preferred option”. Hitchin Town Hall Ltd, a group of unpaid volunteers with a variety of essential skills, was created to fund and manage the “community’ part of the project. NHDC would manage the museum, HTHLtd would manage the Mountford Hall and Lucas Room, and some facilities would be shared, with HTHLtd managing a cafe for the whole complex. They have worked extremely hard to fulfil is seen as a very valuable contribution to the community of Hitchin. NHDC allocated funds of £3.4m for the museum. 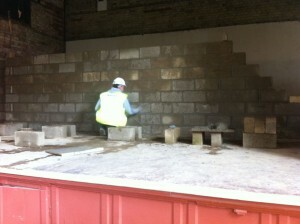 HTHLtd applied to the Community Builders Fund for a grant and loan of £850k, and the scheme seemed viable. HTHLtd expected to have the responsibility of managing the Hall and Lucas Room, generating income to pay off the loans, and fundraising to pay for various start-up costs, but plans have changed, with NHDC now expected to manage both parts of the site. Hitchin Town Hall closed to the public in October 2012 and Hitchin Museum at about the same time. In April 2013 HTHLtd gained the Council’s approval to purchase number 15 Brand Street. It had bought number 14 earlier, and it was hoped that this extra space would not only improve the entrance area, but might provide extra museum space which would eventually free up the stage. Construction work (and some demolition) began on the site at the end of 2014. The whole District Museum and Town Hall should be opening in December 2015. Further information is available on the NHDC website with a video walkround of the museum and Town Hall.